ALLTEC specialises in manufacturing laser systems and workstations for identifying, marking and engraving products for the medical industry, and also in automotive, plastics and electronic markets. FOBA, a part of ALLTEC, is responsible for marking lasers and laser marking machines for a range of materials and parts in the medical industry, including plastic and metal devices. Laser and engraving workstations are used for marking equipment such as surgical instruments and implants, and many other medical devices. All laser marking solutions support equipment producers that have to comply with legal regulations, for example, Unique Device Identification (UDI). ALLTEC uses FOBA as a sales channel for laser part marking and engraving, and as a worldwide sales and service branch for international markets. The company’s product line includes original equipment manufacturer (OEM) marking lasers for integration into production systems and lines, stand-alone laser marking workstations and laser engraving machines. FOBA offers various laser technologies and value-adding accessories and options such as vision systems. Due to the range of different wavelengths, performance categories and pulse widths, materials can be branded with reliable and permanent markings that comply with strict hygiene requirements and regulations. Laser markings can be made on stainless steel, titanium, silver, ceramics and various plastics. FOBA’s markings are easy-to-read, traceable and UDI-compliant even after centuple sterilisations. FOBA provides laser marking equipment for marking without using inks or solvents, for tools with plain surfaces to prevent germs from sticking on them. Medical device applications include engraving surgical and dental instruments and implants such as bone plates and screws, hips and artificial joints, as well as catheters and insulin pumps. With machine built-in vision systems, FOBA’s laser marking workstations provide a laser marking process, which helps to minimise waste and improve product quality. The company offers laser technology for permanent, correctly positioned and readable markings to guarantee products can be traced. FOBA’s Holistic Enhanced Laser Process (HELP) is a closed-loop, vision-based laser marking process that helps to comply with UDI. HELP guarantees quality assurance by verifying marking contents on the machine in the same position to an external device to avoid defects. FOBA’s laser technology combined with a patented mark alignment and verification system known as Intelligent Mark Positioning (IMP), as well as state-of-the-art accessories ensures a reliable, high-precision production process. HELP provides pre-mark verification prior to marking and post-mark validation. The IMP system automatically detects the position of a device and aligns the marking and engraving content precisely. Optical verification is used to verify laser marking content and position, which reduces product waste and quality issues. During the post-mark verification process, the content of 1D and 2D codes can be directly verified, which is important for compliance with UDI regulations set by US Food and Drug Administration (FDA). FOBA’s UV marking laser V.0020-uv is the ideal solution for marking medical plastics and sensitive products, including catheters or invasive devices such as cannulas or insulin pumps that require sterilisation. Cold laser markings produced by an ultraviolet laser marker meet requirements for strict hygiene and invasive applications. V.0020-uv works with minimum heat and photochemically colours the material’s surface, instead of foaming it. The solution achieves high-contrast and easy-to-read marks. The material’s surface remains plain and undamaged to prevent germs from adhering to the surface. Unmarkable materials such as white polyamides or silicones can be laser-marked with V.0020-uv. With the second international Patient Safety Day taking place in September, FOBA and MedicalMountains highlight their contributions with laser marking. UDI is a unique device identification system created and regulated by the US Food and Drug Administration (FDA). In view of its optimum compatibility with the identification requirements in medical technology, laser technology represents the solution for marking medical devices made of virtually any material. The UDI rule for medical devices is a big topic among manufacturers. More medical devices need to be marked UDI compliant, while increasing pressure to cut costs is forcing manufacturers to improve their production efficiency. With its Y-Series, FOBA laser marking and engraving is introducing the next generation of high-precision fibre lasers for direct part and product marking. Plastic and plastic parts are used in nearly every industry. For traceability and quality assurance reasons or because of protection against plagiarism, plastic parts have to be readable and permanently marked. Lasers are used in different ways for processing medical devices. 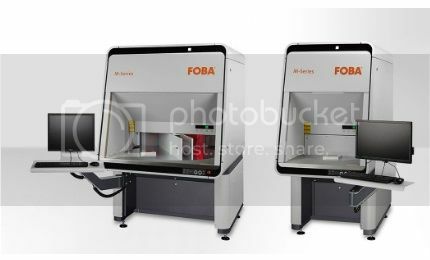 FOBA Laser Marking and Engraving completes its M-Series of compact workstations for industrial laser material processing.